There are reports that Japan Display (the new small/medium display maker that merged Sony, Hitachi and Toshiba's businesses) plans to accelerate OLED mass production. They plan to invest $1.3 billion in OLED R&D (which probably includes pilot production plants), and later on invest a further $1.4 billion towards mass production. We don't know when they actually plan to start producing panels. 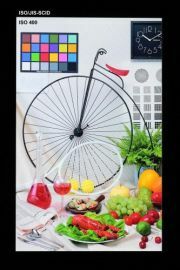 Toshiba has developed a new 6.1" LTPS LCD panel that features 2560x1600 resolution - that's 498 ppi. 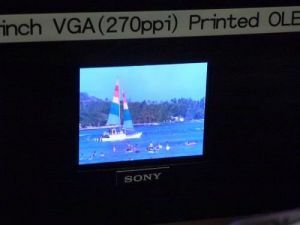 The panel also features 1,000:1 contrast ratio, 16.7 million colors and 176-degrees viewing angles. Yesterday we reported that Sony, Toshiba and Hitachi have signed an agreement to establish a new small/medium display business. Today we read some updates regarding the OLED plans of this new company. They certainly consider OLEDs to be the 'core technology' of the next generation small size and medium size displays, and will invest in OLED R&D. Interestingly Sony says that their current OLED program focuses on larger OLED panels (17", 24") and so this business will remain at Sony. However they will provide technical OLED support for the new company. Sony is also considering transferring OLED patents to the new company. As we reported back in June, Sony, Toshiba and Hitachi have signed an agreement to establish a new small/medium display business - with aims to be the world's largest producer of touch LCD displays. The new company will invest in advanced R&D, focusing on next-generation technologies, including high resolution and thin OLEDs. Japan's government fund Innovation Network Corporation (INCJ) will invest around ¥200 billion (around $2.5 billion) in the new company and will own 70% of the shares. The rest will be split evenly between Sony, Toshiba and Hitachi, who will transfer all their related technology and their shares in their small/medium display subsidiaries. Update: This news is now official. There are reports that Hitachi is in talks with Sony and Toshiba to join their upcoming small/medium display joint venture. The new company aims to be the world's largest producer of touch LCD displays, and will also develop and produce OLED displays. Japan's government fund Innovation Network Corporation (INCJ) will fund the new company and own around 70%-80%. Originally they planned to invest around ¥100 billion (around $1.25 billion), but if Hitachi will join this may double to $2.5 billion. The extra money will reportedly be used to expand OLED capacity. Sony and Toshiba to establish a joint OLED fab? There's an interesting report that Sony and Toshiba plan to join forces in a new display unit, aiming for small/medium displays (for mobile phones and tablets). According to the report, the new unit will establish an OLED fab in Higashiura, Japan. In fact once they setup the new unit, Toshiba Mobile Display (TMDisplay) and Sony Mobile Display will cease to exist. The new unit will be in charge of all OLED R&D by both companies. Interestingly, the Innovation Network Corp (a Japanese government fund) will fund the new company and will own around 70%-80%. Sony is already producing OLEDs in a very small scale (mostly for their high-end broadcasting monitors) while Toshiba's mobile display unit (TMDisplay) scrapped their OLED plan back in October 2010 to focus on LCDs. It'll be great news if these two companies will indeed start to mass produce OLED displays. Update: We have some info and a new photo of Toshiba's flexible OLED prototype. See below. Toshiba is showing an ultra thin (0.1mm) 3" flexible OLED panel prototype (160x120) that weights just one gram. 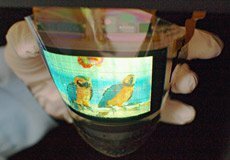 The OLED is built using an oxide semiconductor TFT (IGZO) unto a plastic substrate. Toshiba says that they will be able to start producing displays based on this production method by 2014 or 2015. Toshiba's OLED uses white OLED material with color filters. The architecture is bottom-emission. 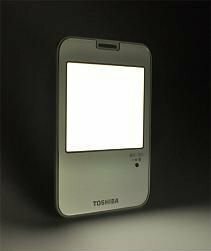 Toshiba says that the managed to lower the process temperature to 200°C, and so were able to use the plastic substrate.